When I was a girl, we lived near a neighborhood house with a murky, muck-bottomed pond in the backyard. In those days nobody thought about insurance liability and suing, so this pond was a kid magnet. Boys and girls alike would wad soft white bread or squeeze American cheese slices into balls that we molded onto fish hooks, tossing the bobbered lines into the brown water, hopefully avoiding seaweed or cattails. We caught black bullheads (sleek, dark, whiskered catfish), bluegills and the occasional sunfish or crappie, and usually let them go. Sometimes we saw pudgy black tadpoles wobbling in the shallows. Since my parents had built a little Japanese-style fish pond in our backyard, my sister and I could bring home tadpoles, frogs, minnows, and young bluegills as pets. Toads lived in our yard anyway. When our family went on vacation, often camping in Wisconsin or Michigan, my sister and I would catch critters and haul them home in jars. As members of a private campground with a good-sized lake created from coal mining, we’d go camping on summer weekends and catch creatures there to bring home. We were young biologists and masters at capturing our pets. Last weekend my sister and I and our eldest girls were wading in my dad’s small lake looking for tadpoles. Dad said he’d seen black clouds of them a few days before, so the girls were excited, but pollywogs were nowhere in sight that day. Instead, we had to use hawk eyes to watch for rare grey dots squiggling among fronds of seaweed. I was very proud to watch my daughter scoop up a couple under the tutelage of my sister. Dad was standing close by on the beach watching, and I wondered if he felt the same joy I did at remembering the old days of his girls on the prowl, imagining our big girls as his little dark-haired hunters. He and my mom gave us our love of nature, and we hope we’ve passed it on to our children. 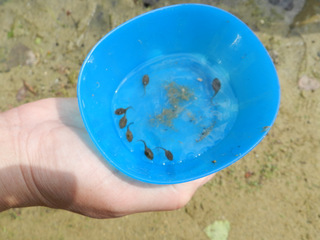 We know that the joy of catching tadpoles is something never outgrown. I hope others have enjoyed the thrill of catching tadpoles, frogs, or toads. Do you have any memories of catching little creatures? 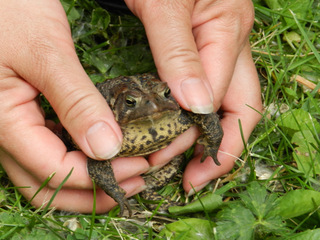 For those who don’t know, if you ever do catch a toad, use two fingers to hold him carefully behind the front legs until he “pees.” He won’t give you warts, but wash your hands after you let him go. This entry was posted in memories, writing prompt. Bookmark the permalink. Thanks for this slice of life/nature writing. To have that connection to nature–especially through your parents–is very precious. Ha. I hadn’t read this yet, but it’s a similar theme. Nice work here. What, Matt? Didn’t leave me a froggie poem?! Thanks for stopping by, Janet and Poemblaze.